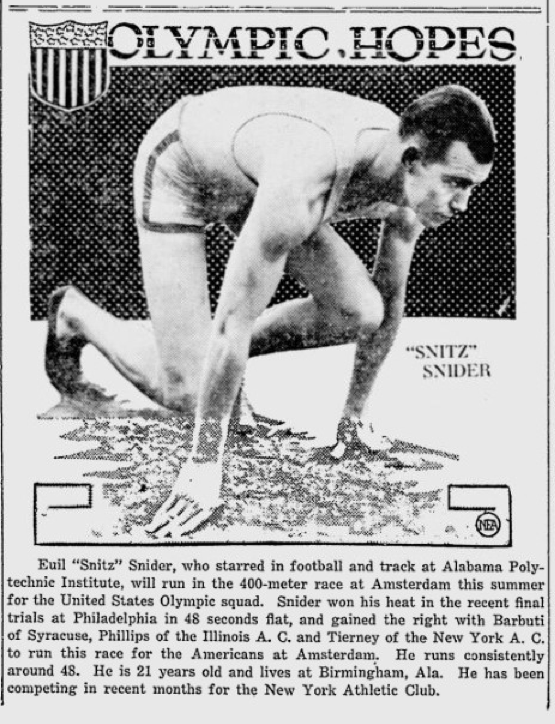 Snitz Snider’s parents won a gold medal in Baby Naming. 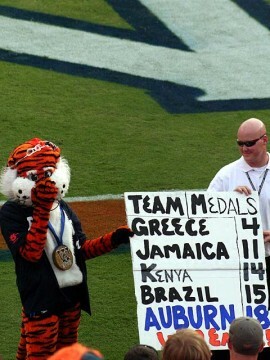 Aubie bragged about the university’s medals after the 2008 Olympics. Why not? People who bleed orange and blue won more bling than many of the countries nations that showed up in Beijing, tying Spain and Canada at 14th among nations with 18 trips to the podium. And though Aubie’s petition to have the fight song played during the awards ceremonies was turned down by the IOC, he’ll likely be counting medals again this year. Auburn sent 27 athletes and four coaches to the United Kingdom. That’s a larger contingent than 126 countries. Historically the Tigers have brought home plenty of hardware, 46 medals going into the London Games. A family among nations, Auburn is the 44th most prolific winner of all time on the international stage. Snider would go on to become a high school coaching icon in Bessemer, Ala. for three decades, where a football stadium is today named in his honor. He died in 1975 and was posthumously inducted into the Alabama Sports Hall of Fame in 1977 and the AHSAA Hall of Fame in 1991. Four years later Auburn returned to the Olympics on the legs of Pearcy Beard, a Kentucky native who became a world-class hurdler during his tenure at Auburn. 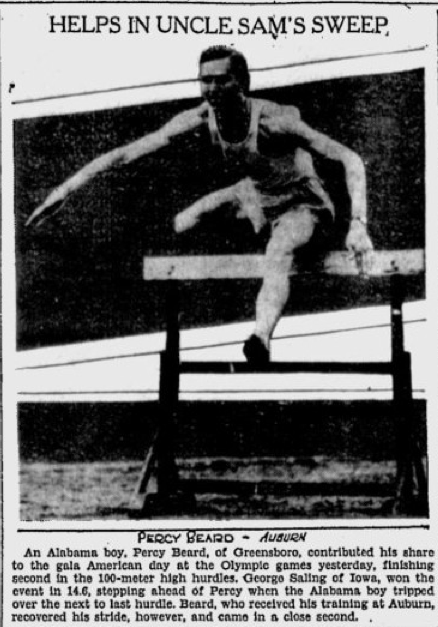 Beard carried high hopes into the 1932 games in Los Angeles, where he ran preliminary times of 14.7 and 14.6 in the 110 meter hurdles. He raced to the silver, finishing one-tenth of a second behind George Saling, another American, who happened to set the world record that day. We like to think Saling, an Iowa boy, got by him only because Beard was telling him about the loveliest village. Beard ultimately set records in hurdle races for almost a decade before becoming a coach for 27 years at the University of Florida, where the track and field facility still bears his name. Auburn’s first medalist died in 1990, at the age of 82, living long enough to be inducted into the Alabama Sports Hall of Fame, the USA Track & Field Hall of Fame and the University of Florida Athletic Hall of Fame. He was posthumously inducted into the U.S. Track & Field and Cross Country Coaches Association Hall of Fame in 1995 and added to the Auburn Tiger Trail in 1996. And now the medal count begins once again again. Print out this list, put War Eagle on your MP3 player, and get ready for Olympic vict’ry. Photos via The Warsaw Union and The Tuscaloosa News.